Grade 5 Indian Residential Schools and Reconciliation Teacher Resource Guide: This document includes teaching and learning strategies, lesson plans, assessment ideas, extensive resource lists, maps and blackline masters. Some of the recommended texts include: Neekna & Chenai, Shi-shi-etko, The Secret of the Dance, Shin-Chi’s canoe, No Time to Say Goodbye (Thomas and Joey’s Story), Fatty Legs, When I Was Eight, sections of Seepeetza, sections of They Called Me Number One. Namawayut: we are all one; Video about truth and reconciliation in Canada : “Chief Robert Joseph shares his experience as a residential school survivor and the importance of truth and reconciliation in Canada. [4m 20s] — CBC. Adams, Ian. (1967.02.01). The Lonely Death of Charlie Wenjack. Mcleans Magazine. Gord Downies’s The Secret Path, CBC video : “Gord Downie’s The Secret Path and a post-show CBC Arts live panel on the road to reconciliation. Movie length 60 minutes. Panel discussion begins at 59:45. 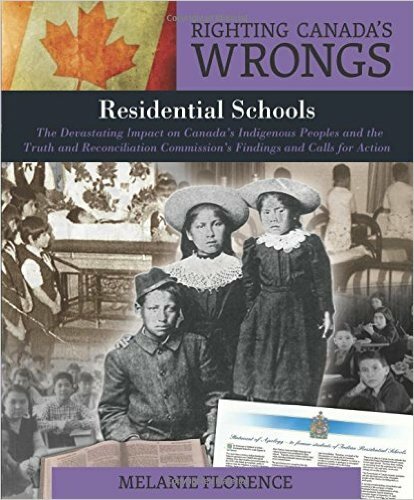 The following links are found in the book Residential Schools (Righting Canada’s Wrongs).